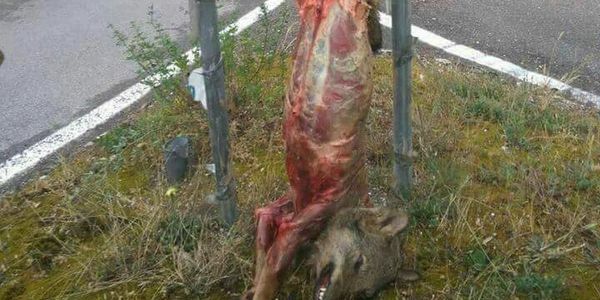 petition: EU: Demand Italy protect the Italian wolf from poachers. Investigate Mr Rabazzi for his declarations! EU: Demand Italy protect the Italian wolf from poachers. Investigate Mr Rabazzi for his declarations! SO YOU CAN CARRY ON SIGNING UNTIL THEN, THANK YOU! To the European Commission, Nature 2000. This petition will be delivered to EU on the 18th of May 2017. In Tuscany, Italy, one more wolf has been brutally killed, then skinned and hung from a street sign with the note: "NO to Wolf Culling? YES to Prevention." It is a criminal and vile act, a declaration of war towards the European and Italian legislation, which protects this vulnerable species. IS THIS THE FACE TUSCANY WANTS TO SHOW THE WORLD!?! Many wolves have been poached in the past few months. Local farmers refuse to adopt any of the preventative measures imposed by European legislation and chose violence and criminal acts, instead. The Italian government seems to allow this and people are scared to talk. It is very sad to see that authorities in Tuscany are openly opposed to the protection of wolves and wildlife in general and are criminally declaring war on protected species. Most of all, they are showing total disrespect for the European law, 20 Jan 2017/ 128, pag 1-3 and paragraph 11 http://eur-lex.europa.eu/legal-content/IT/TXT/?uri=CELEX%3A32017R0128 which protects wolves and also hybrids and requires the approval of specific derogations by the Italian Government for any kind of disturbance. Bad practices as hunting at night and with illegal devices and killing with traps and poison inside protected areas are all habits widespread and sadly accepted by local population and authorities. We, people and tourists of the world, do not want to support this horrible behavior. We urge the EU to intervene on the Italian Minister Galletti and Regione Toscana for not protecting the Italian wolf from poachers. These declarations have caused a wave of violence on wolves and other wild animals, illegally killed by bullets and poison. For Rabazzi’s many declarations, see links below. We also ask EU to investigate how the funds EU have been allocating to Italian farmers, for their cattle loss due to wolf predation have actually been used. To verify if sufficient measures have been applied to prevent accidents and if the deaths reported are actually linked to wolves attacks or not. We are nearly at 30.000 signatures and we want to reach 50.000 before the 20th of May, please share! The Queen guitarist Dr. Brian May is also supporting this petition and had attacked Tuscany on the poaching issue and for this brutal last killing and had twitted: “Sign this petition to fight this disgusting behaviour- the shame of Tuscany."